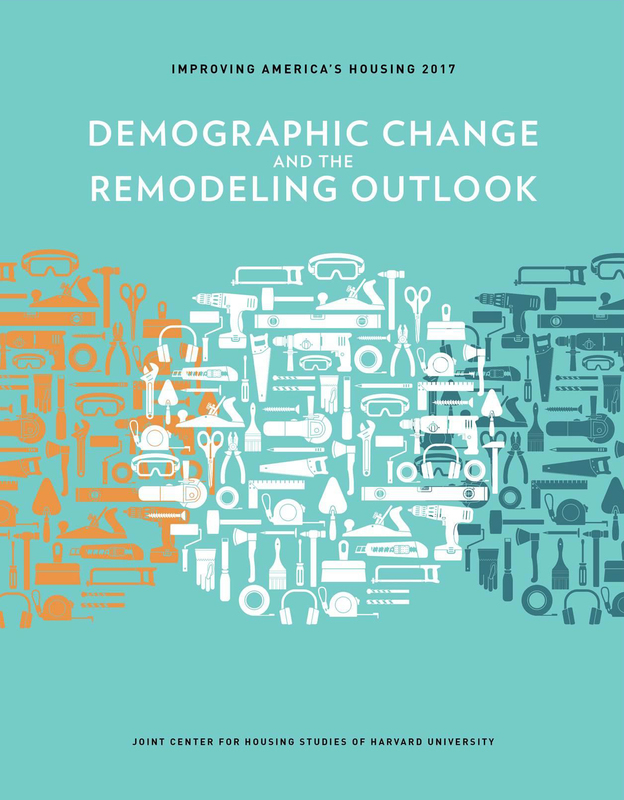 Remodeling will continue to rise through 2025, fueled by aging homeowners. Millennials may struggle to manifest the funds for remodeling projects. The construction industry is aging along with the rest of the country. Traditionally, a healthy housing market is also good for the remodeling industry. For proof of this, one only needs to look at Home Depot, which recently reported strong fiscal fourth-quarter earnings. As people see the value increase in their homes, they are more motivated to do everything they can to maximize not just their current enjoyment but potential future returns. There are additional factors that may come into play over the next few years, including the aging of America. A recent report from the Harvard Joint Center for Housing Studies focused on baby boomers and the desire of many older people to age in place. Most of the existing housing stock is not suitable for those with accessibility issues. 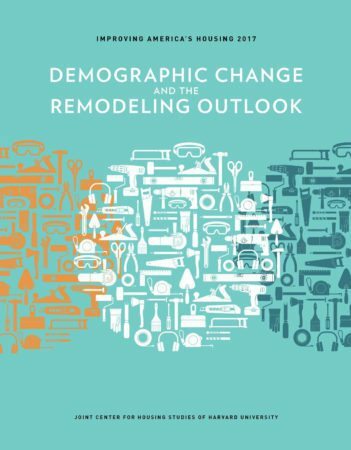 And a new report — “Improving America’s Housing 2017: Demographic Change and the Remodeling Outlook” by the Harvard Joint Center for Housing Studies — focuses on the opportunities for growth in the remodeling industry. Good news for the home improvement world comes from two distinct groups: baby boomers seeking to make their homes suitable for their future accessibility challenges, and millennials who are moving into homeownership for the first time and buying older, more affordable homes in need of renovation. Residential remodeling spiked to an all-time high of $340 billion in 2015, beating the peak reached during the 2007 housing boom. The report predicts that spending by owners on improvements will rise 2 percentage points on average through 2025, keeping pace with expected economic growth. The boom will mostly be fueled by older owners adapting their homes. Spending by homeowners age 55 and over is expected to grow by nearly 33 percent by 2025, accounting for more than three-quarters of total gains over the decade. Gen-Xers, statistically in their prime remodeling years, will contribute as well — though many were burned during the housing crash. For millennials, the remodeling challenge is a combination of rising mortgage interest rates and high home prices, which mean that they are already spending a significant sum to acquire a home and may have fewer resources to make improvements. Millennials are a generation that grew up on a steady diet of HGTV and house-flipping television shows, and many have an ongoing passion for do-it-yourself projects. They also tend to be more interested in energy-efficient and green projects as well as outfitting properties with smart home features. Owners of homes built before 1980 who were under age 35 invested about a third more in renovations in 2015 than the average for all owners in their age group. Owners in major metro areas have a greater incentive to make improvements because of higher housing prices. They may receive more value for their efforts and also have a larger amount of home equity to pull from to fund their efforts. However, the high prices in these areas also mean that younger homeowners don’t have the funds to spend. Aggregate home improvement spending by homeowners under age 35 in more affordable markets such as Cincinnati, Detroit and Kansas City was more than twice that in high-cost markets such as San Francisco and Los Angeles in 2015. The housing downturn was rough on residential remodelers; nearly half of them closed or scaled down their businesses significantly. The overall size of the construction management and trades workforce shrank by 20 percent from 2007 to 2012. By 2015, the number of workers remained unchanged from 2012 at 7.2 million, but the industry unemployment rate was down from 14.2 percent to 7.9 percent. Another problem for the remodeling industry is lurking. The construction industry workforce is aging, with 1 in 6 workers age 55 or over, up from 1 in 10 in 2007. The report pointed out that construction and remodeling industries will need to attract younger employees and workers from traditionally underrepresented segments, including women. The ongoing question for all remodelers is, how much is too much? While trend-watchers predict that many more accessible homes are needed, the risk of over-customization is always present, and homes that are tailored too closely to the needs of the owner may be hard to resell when the time comes. For real estate agents, one way to continue to add value and keep a relationship going between transactions is to be a resource for clients considering major remodels. Every year, Remodeling magazine issues a Cost vs. Value report, which is an excellent source of information to share with those considering major renovations. Remodeling that is out of step with a neighborhood may also cause a client to spend more than he or she should. With some adaptations for older owners, it may make sense to focus on changes which can be modified as needed. Before a remodel, it may make sense to get an updated CMA (comparative market analysis) that reflects what has happened in the market since the last time they were looking. Looking at the images of current homes nearby for sale can also help clients see what projects might be most worth their time.